20 Hour Built-in Rechargeable Battery. Soundcast and their engineers have managed to combine the very latest Bluetooth v3.0 technology along with thier world-renowned	portable music systems. The result of all this is the Melody, a elegant, portable, lightweight all-weather Wireless Bluetooth® speaker that others can only aspire to. Featuring the	latest in Bluetooth connectivity along with an auxiliary audio input means that virtually any device could be connected to the Melody. 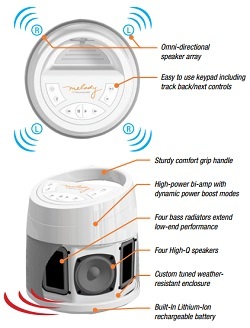 All this combined with Soundcasts unmatched portable sound quality, Melody will become your modern day personal sound machine putting life into BBQs, Picnics and other outdoor pursuits. Melody’s small size makes it easier than ever to take your music anywhere and everywhere you want to. Don’t let the petite size or elegant looks fool you, it has the power to rock any beach, house, garden or indoor/outdoor gathering you care to host. Melody benefits from splash-proof protection and UV resistant plastics resulting in a design that’s a lot more than just a pretty face. Melody pairs up	perfectly with all of your favorite Bluetooth enabled smartphones and portable devices. Stream music from the cloud, your personal music collection or use a wide variety of Apps including Pandora®, Spotify™, Rhapsody®, TuneIn® and hundreds of others. Control your music directly from Melody’s keypad and leave your phone in your pocket or bag. 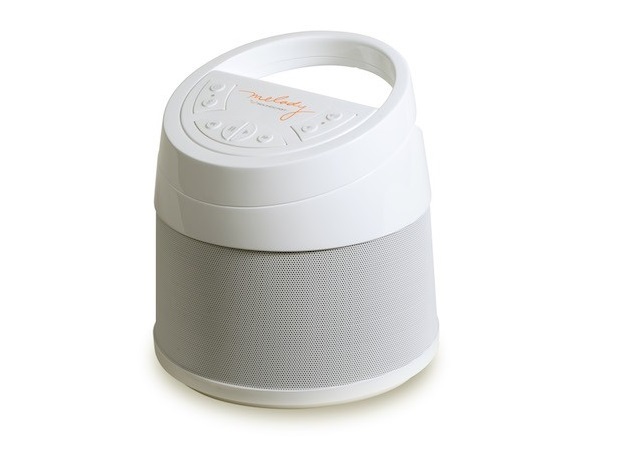 Make anybody and everybody the DJ with Melody the take anywhere, everywhere	wireless speaker that is ready for any occasion. Robust weather resistant enclosure designed to operate indoors and outdoors, in cold and heat, in moderate snow and rain. Built-in high-capacity lithium-ion battery pack provides up to 20 hours of playtime on a single charge. Convenient volume and remote functions including; Play, Pause, Track Next, Back commands using keypad on Melody without having to access your Smartphone or mobile device. Bluetooth standard up to 33ft broadcast range depending on location/environment. Rapid Battery Charging circuit supports flexible USB charging from many sources (A/C, Car, Boat, RV, Computer, etc). AAC	/ aptX Lossless Quality codecs for superior Bluetooth audio performance with compatible	devices.